Flint, Michigan: Did race and poverty factor into water crisis? 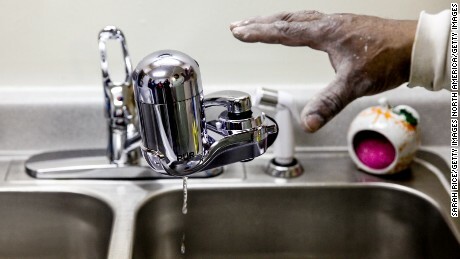 (CNN) The contamination of drinking water in Flint, Michigan, has so outraged community advocates that they now pose a powerful question: Was the city neglected because it is mostly black and about 40% poor? Several advocates say yes. They charge that Flint residents are victims of “environmental racism” — that is, race and poverty factored into how Flint wasn’t adequately protected and how its water became contaminated with lead, making the tap water undrinkable. “Would more have been done, and at a much faster pace, if nearly 40 percent of Flint residents were not living below the poverty line? The answer is unequivocally yes,” the NAACP said in a statement. “While it might not be intentional, there’s this implicit bias against older cities — particularly older cities with poverty (and) majority-minority communities,” said Democratic U.S. Rep. Dan Kildee, who represents the Flint area. “It’s hard for me to imagine the indifference that we’ve seen exhibited if this had happened in a much more affluent community,” he said. NAACP President and CEO Cornell Brooks drew a direct equation between Flint’s socioeconomic factors and the toxic drinking water. “Environmental Racism + Indifference = Lead in the Water & Blood,” he tweeted. State officials, however, vehemently dispute the claim. For sure, “there were major failures here,” Snyder added. But he blamed the crisis on incompetent bureaucrats, specifically citing “a handful of quote-unquote experts that were career civil servant people that made terrible decisions,” he said. Already, Susan Hedman, the U.S. Environmental Protection Agency’s regional administrator for Flint, Michigan, has resigned in the wake of the crisis. The issue of environmental racism was likely to be raised again at a NAACP “public mass meeting” late Tuesday afternoon in Flint. Flint is 57% black, 37% white, 4% Latino and 4% mixed race; more than 41% of its resident live below the poverty level, the U.S. Census says. The matter has been discussed in social media, particularly by filmmaker and Flint native Michael Moore. Moore said the governor should be arrested for his role in the Flint water crisis. A state plan to save $15 million on Flint’s water bills may now cost $1.5 billion in clean-up, Moore said in his online petition for help from President Barack Obama. “This is a racial killing. Flint MI is 60% black. When u knowingly poison a black city, u r committing a version of genocide #ArrestGovSnyder,” Moore tweeted at one point. “Just to be clear: all 102K residents of Flint have been exposed to toxic water, all of Flint’s kids have ingested lead, & 10 ppl have died,” Moore tweeted on another occasion. The Black Lives Matter group said African-Americans, especially those in rural and poor area, have long been denied equal access to clean drinking water. “The crisis in Flint is not an isolated incident. State violence in the form of contaminated water or no access to water at all is pervasive in Black communities,” the group said on its website. On Monday, state Attorney General Bill Schuette said he is appointing an ex-prosecutor and Detroit’s former FBI chief to join the investigation into Flint’s water crisis, creating a “conflict wall” between the state’s inquiry and the lawsuits targeting the state. “I would certainly not bathe a newborn child or a young infant in this bad water, and if you can’t drink the bad water, you shouldn’t pay for it,” Schuette said. Flint’s state of emergency — declared at municipal and state levels — began years ago when the city suffered a financial emergency. The state took over the city’s budget and decided to temporarily switch Flint’s water source from Lake Huron to the Flint River as a cost-saving measure until a new supply line to Lake Huron was ready. After the April 2014 switch, residents complained their water had problems. Virginia Tech researchers found the water was highly corrosive. A class-action lawsuit alleges the state Department of Environmental Quality didn’t treat the water for corrosion, in accordance with federal law, and because so many service lines to Flint are made of lead, the noxious element leached into the water of the city’s homes. The city switched back to the Lake Huron water supply in October, but the damage was already done to the lead pipes. The state is now handing out filters and bottled water with the National Guard.